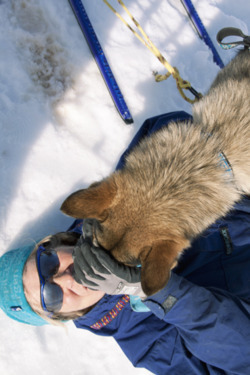 Inni Granskauen Kennel is run by Johanne Sundby who shares her passion for sleddogs with interested people. The Kennel is located in Maridalen, Oslo in the middle of the forest (thereby the name Inni Granskauen). The dogs run loose at all times in different sized dogyards. We train our dogs form the Kennel and have mile after mile of gravel roads. Johanne also owns two cabins, a little hut in Julussdalen, Elverum and a cabin at Bulidalen, Hemsedal. They are perfect places for mushing. We use our dogs in many ways throughout the year. In the autumn and winter our mainly goal is to train the dogs for the sledseason. We use a wheeled 4 wheeled non motorized wagon to train before the snow, and sleds when the condition allows it. We participate in mid- and long- distance races such as Vikerfjell løpet, Hallingen, Femundløpet and others. In May after the racing season is over there is room for trips in the mountains. Every year we have at least one long trip in the springtime at Femundsmarka or Hardangervidda. It is in this time of the year the nicest trips are made. Inni Granskauen Kennel is unique in the way of letting young and old people that want to experience and learn about sleddogs and mushing able to do so. The dogs are used to people and has a high level of respect for the human being in general. They are very social and happy. The dogs enjoy being around at different places and they love lots of action! We buy most of our dogs from other Siberian mushers but occasionally breed dogs of our own and have older dogs for sale. Please take contact for more information. Our focus is on social dogs that have a work ethic.